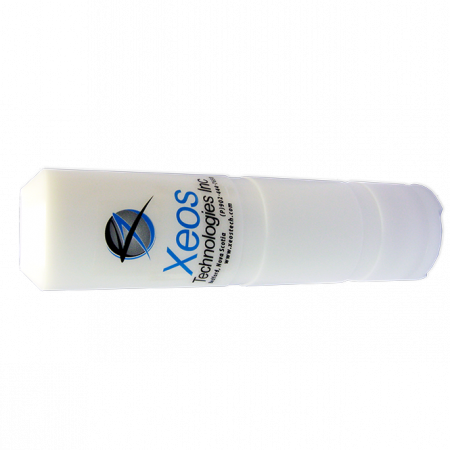 Xeos Technologies have announced the development of a new ROV specific LED flasher - the XMF-11K Crisis. A spin-off of the standard XMF-11K (detailed below), the Crisis version incorporates new voltage-sensing technology that will aid in the recovery of ROVs that have lost power subsea. A new voltage sensing end-cap senses power coming from the vehicle. In the event of vehicle power loss, the voltage sensor triggers the flasher which draws power from its battery pack. Whether the vehicle is ballasted to float or sink the flasher will remain on until switched off by the operator. The standard XMF-11K can be reconfigured to Crisis mode, giving the operator a 2 in 1 flasher than can activate when the ROV breaks the water’s surface or when it loses power subsea. The XMF-11K is an independently powered, self-contained surface flasher that is fully submersible to 11,000 m (36,089 ft). The depth rating on this ROV beacon will take you wherever you need to go under any ocean. This ROV flasher has been designed from the ground up to exceed your expectations. Our super-bright LED provides unparalleled visibility in even the worst conditions and the reliability and longevity provided by our solid state surface sensor is a significant improvement over pressure sensing solutions. For ease of mounting the XMF-11K is also available in a 'remote head' version. The XMF-11K provides superior functionality in a miniaturised package. The Apollo is an independently powered, self-contained mooring and ROV location and tracking beacon with the power of an ultra-bright LED Flasher combined with satellite communications. Get notification of the Apollo’s arrival at the surface from anywhere on earth via the Iridium Low Earth Orbit satellite communication system. Once you arrive on site, you will get unparalleled visibility even in the worst conditions. This beacon has been designed to meet and exceed your expectations. Apollo is fully submersible and has been rated to 11,000 m (36,089 ft) below sea level. That includes Challenger Deep. The solid state surface sensor provides a measure of reliability unavailable in mechanical methods and is available in a 'remote head' version. Apollo provides superior functionality and flexibility in a miniaturised package. The KILO Subsurface Iridium Satellite Mooring Location and Tracking Beacon is a self-contained submersible beacon with miniature, cutting edge Iridium satellite transceiver that is fully submersible to 2500m. The internal, customer replaceable AA battery pack, lasts over a year in deployment. With the KILO oceanographic and environmental instrument mooring professionals have greater control in instantly and accurately locating and recovering high value, free drifting assets at sea. Platform turned upside down? No Problem! Rover is an independently powered, self-contained Iridium satellite transceiver designed to work in the most rugged ocean environments. Things don’t always follow plan, so the Rover features independent dual GPS and Iridium patch antennas so that in the event the surface expression is flipped over, the unit will continue to record its position and transmit it back to you. Packaged in a ruggedised, UV protected, marine grade housing the Rover makes use of the low power, real time Iridium satellite constellation and GPS to reliably transmit the buoy’s position automatically or on demand at any time. Applications include surface location and tracking of autonomous unmanned surface vessels (AUV). The XMi-11K is an independently powered, self-contained Iridium satellite ROV beacon that is fully submersible to 11,000 m (36,089 ft). This beacon has been designed to protect your valuable assets and make their recovery even easier. The XMi-11K features an ultra low power water sensor to optimise battery life while ensuring you will be notified of any surfacing event for asset location and tracking. The enclosure is all titanium with a solid state surface sensor and an optional remote head. The XMB-11K is an independently powered, self-contained RF ROV and asset location and tracking beacon that is fully submersible to 11,000 m (36,089 ft). The depth rating on this beacon will take you wherever you need to go under any ocean. This beacon has been designed to protect your valuable assets and make their recovery even easier. From the Grade 9 titanium and glass enclosure, the available remote head, to the solid state surface sensor, the XMB-11K represents a huge step forward for submersible VHF beacons. Reliable, continuous information from the ocean’s surface can be difficult to gather. OSKER and ROBY offer global communications via the Iridium satellite system in a small, rugged package with sophisticated on-board programming. Manage 2-way communication between the tracking unit and XeosOnline™ monitoring system for full remote configurability. The OSKER is a single use air-deployed surface tracker, with antennas and power integrated. Deployed in a group, the OSKERs provide accurate real time tracking over an area of the surface, mapping currents, oil spills, or other phenomenon. Set the Watch Circle to get automatic notification if any of the units travel outside the designated area.